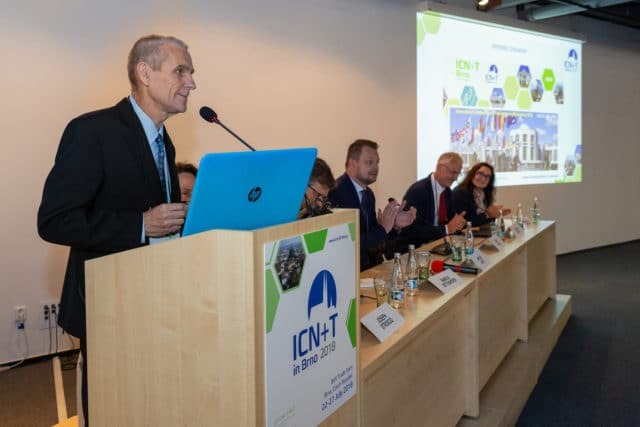 Brno became the host of the prestigious ICN+T conference thanks to the successful joint request of CEITEC and the Institute of Physics of the Academy of Sciences of the Czech Republic in 2013. During the days 23-27 July, the world’s leading experts in nanotechnology were introduced at the Brno Exhibition Center. The International Conference on nanosciences and nanotechnologies (ICN+T), organized by the Institute of Physics of the Academy of Sciences, in cooperation with Brno Technical University (CEITEC), took place here. Nearly 350 participants attended the event, not only from the Czech Republic but also from Switzerland, Germany, Korea, Israel, China and other countries. Brno became the host of the prestigious ICN+T conference thanks to the successful joint request of CEITEC and the Institute of Physics of the Academy of Sciences of the Czech Republic in 2013. The main organizers of the conference were representatives of the two institutes – Antonín Fejfar from Institute of Physics of the Academy of Sciences and Professor Tomáš Šikola, coordinator of the research program of Advanced Nanotechnology and Microtechnology at CEITEC and Director of the Institute of Physical Engineering at the Faculty of Mechanical Engineering, University of Technology. The scientific program of the conference, which was attended by 350 invited scientists from different parts of the world, covered a wide range of topics including microscopy, spectroscopy, nanosystems, nanomechanics, nanomagnetism, nano-optics, nanobiotechnology and development in materials used in nanotechnology. Among the plenary speakers was the lead researcher, Jerry D. Tersoff from the US company IBM, experimental physicist Ali Yazdani of Princeton University, and nanoscopy specialist Rainer Hillenbrand from the Spanish association for nanotechnology research NanoGUNE. Another of the speakers was Ondřej Křivánek, co-founder of Nion of Washington, which belongs to one of the world’s leading developers of highly sensitive electron microscopes. Finally, the Austrian physicist, Ulrike Diebold, from the Vienna University of Technology presented. In addition to more than 50 plenary sessions and a diverse technical program, it was possible to visit an exhibition with the latest available equipment in nanotechnology, including the world’s leading supplier, TESCAN, with the unique electron microscope TESCAN VEGA 3 LMU allowing the observation of conductive and non-conductive materials. Delegates also had a unique opportunity to visit local institutions, get acquainted with their technical equipment and listen to presentations about new developments in the scientific field. To support the building and strengthening of social networks and friendship, a social dinner was held in the very center of Brno, in Besední dům. “The ICN+T event has gone extremely well. All the participants and the speakers I spoke to spoke about the conference were very pleased. They praised the program, the food, the gala dinner and the organizational skills. We were very happy with Mrs. Mačakova’s team from C-IN and deserves to be awarded for the co-organization of the event,” added Professor Tomáš Šikola with a smile. After the last conference in Busan, South Korea, C-IN, which provided professional services including accommodation for participants and technical and production services, continued the success and friendly atmosphere of the ICN+T conference. Next year, the event will take place in Malmö, Sweden.